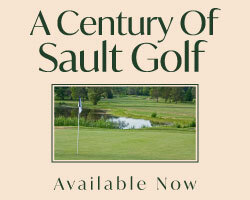 Golf and tennis to your hearts content. 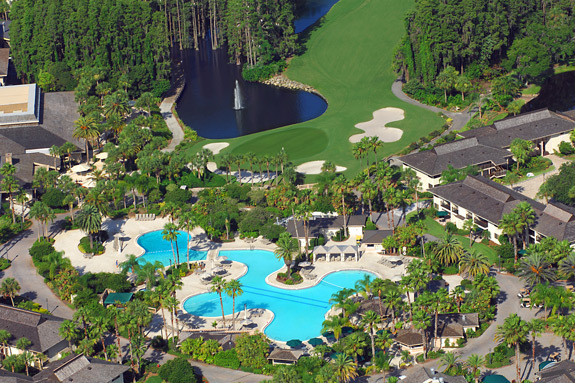 The Saddlebrook Resort, located a mere 30 minutes north of Tampa, is a luxury Florida retreat which can satisfy just about all your business, recreational and pleasure get-away needs. On property you will find a full service conference center, replete with 5-acre team building site, two 18 hole Arnold Palmer designed layouts, 45 tennis courts in every Grand Slam surface, a European style spa, sports & fitness village, a 500,000 gallon superpool and several fine and casual dining options. 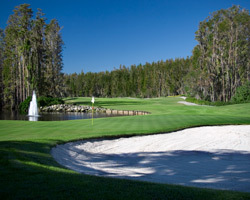 The resort is also home to BannLynch Golf at the Saddlebrook Golf Academy, the Hopman Tennis Program at the Saddlebrook Tennis Academy and the Saddlebrook Prepatory School. The layout of the resort is set up as a walking village which allows you to park your car and then wander on foot from your accommodations to the shops, pool deck, restaurants, fitness village and tennis courts with the driving range, first tees and golf academy building a short golf cart ride away. All of the rooms and suites at the resort are clustered around courtyards overlooking either the golf course, naturalized areas or the superpool. 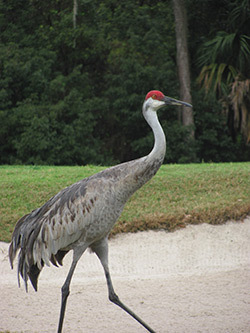 Saddlebrook's two picturesque Arnold Palmer designed golf courses are suitable for players of all abilities. Although the Palmer and Saddlebrook Courses are similar in length, at 6641 and 6664 yards respectively, and characterized with lagoons, wetlands and fairways lined with pines, palms and cypress trees the comparisons end there. 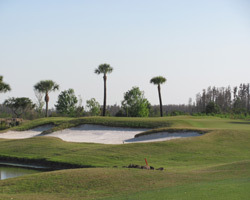 On the Palmer Course the driving areas are relatively open with the trees sparser and there are some fairly significant elevation changes and slants to the fairways that are not so commonly experienced on a Florida golf course. The small elevated green sites are framed with bunkers and slope harshly in places. Although you can let the shaft out at times off the tee, the key to success on the Palmer course is though utilizing strong iron play on the approach shots keeping it below the hole at all times. 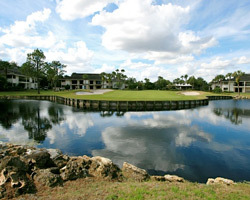 In contrast, the Saddlebrook Course is much flatter and narrower with many of the fairways lined with heavily treed wilderness and there seems to be a lagoon in your sightline at every corner. The greens also present much less undulation than the Palmer Course and are much larger and more forgiving on the approach. A successful campaign on the Saddlebrook will require much more control off the tee and if you employ a grip-it and rip-it attitude here you might find your ball scoop the go to club for the day. If a little game improvement in needed in your ground strokes or iron game then some instructional time spent at either of the tennis or golf Academies will get your games in order. The instructors here know a thing or two about training for success. Know for its state of the art facilities and focus on fitness the Hopman Tennis Program at Saddlebrook has been a breeding ground for many top American players including current touring pros, James Blake, Mardy Fish, John Isner and Mike and Bob Bryan. Also, former Olympic gold medalist and 3 time major champion Jennifer Capriati trained here as a young teen and former world #1’s Martina Hingis and Jim Currier also trained on Saddlebrook’s courts. On the Golf Academy side Master Instructors Steve Bann and Dale Lynch have made the Saddlebrook Golf Training Center base camp for BannLynnch Golf to take advantage of the spectacular practice facilities and state of the art digital learning studio. Learn from pro’s that PGA Tour pro’s such as K.J. 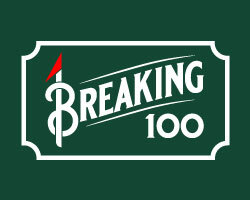 Choi, Geoff Ogilvy, Stuart Appleby, Aaron Baddeley and Kevin Na trust to help them improve. The resort is also home to a fully accredited college prep school. The school serves students from grade 3 to 12 who aspire to excel in golf or tennis while continuing to work towards college. The school campus is located within the confines of the resort and student can choose to board in the supervised community or live off campus. 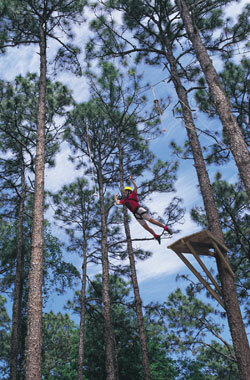 There is plenty for the whole family to do here. While Mom and Dad are busy in the team building centre, playing golf or tennis or spending some quality time relaxing in the spa the kids can take advantage of the S’Kids Club which offers supervised programming for children ages 4 to 12. For those looking to explore the Tampa area there is no shortage of family fun to be had: Legoland, Busch Gardens and the Florida Aquarium are a short drive away and if you need your hockey fix Lighting tickets are much easier, and cheaper, to get your hands on than Leaf tickets. Feature Holes: Holes 12, 13 and 16 exemplify the importance of precise distance control on the Palmer. A drive long down the centre right on hole #12 will run out nicely leaving you with a short iron to a well protected dance floor. Special attention must be taken on the approach for anything above or left of the pin will have you shaking over a nasty downhill slider. There is little room for error on the tee shot to the 13th green. This narrow sloping green is defended by a fronting buttressed lagoon and siding bunkers and with the prevailing winds in your face proper club selection is paramount. A front pin is frightening for past the pin is scary fast and short will have you flirting with the alligators. At 347 yards the 16th may be short in measurement but it is long on intimidation. The tee ball must find a narrow strip of fairway pinched by lagoons on either side and a strategically place bunker left. The approach may only be a pitch but the false fronted elevated green falls off sharply to deep bunkers and is of the three tier variety. Faulty distance control will make thoughts of a birdie a distance memory in a hurry. Feature Holes: There are two wonderful closing hole dogleg right par 4’s on the Saddlebrook Course that will have your knees knocking if a good score is to be protected. The approach shots on holes 9 and 18 must successfully negotiate fronting lagoons and side bunkering to reach their large two tiered putting surfaces. The 406 yards, the front nine closer offers the more forgiving landing area of the two off the tee and a shorter iron will be the weapon of choice on the approach, however, the lagoon wraps around the front of the green and two gaping bunkers protect each side of the huge putting surface. The 425 yards back nine home hole may be the sternest challenge on the entire property. Accuracy is demanded off the tee with the inside of the dogleg protected by a stand of large trees, the lagoon and a lone bunker at the corner and dreaded straight ball will find a sandy resting place through the fairway. A back right top tier sucker pin position is vicious and nothing but a purely struck mid or long iron will come close to the intended target. Penciling in a 4 on both holes will put a spring in your step and your head held high.